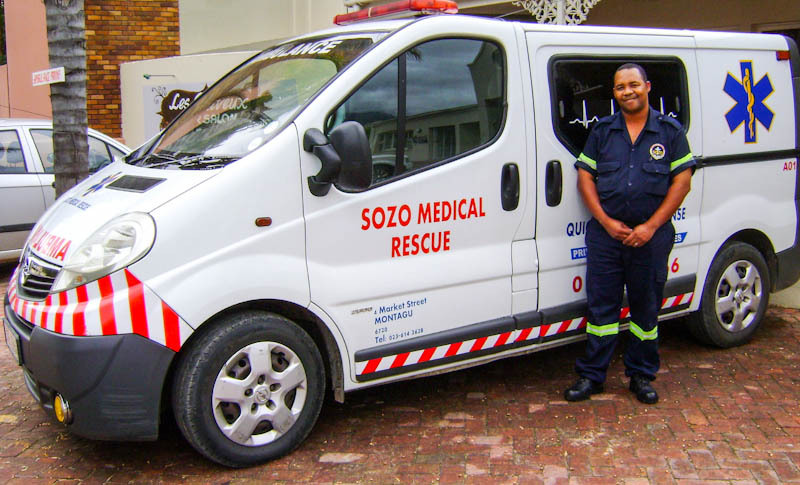 By Montagu Mail - Montagu's unique private Medical Rescue Service Sozo has recently passed two particular milestones that consolidate its position in the town and seem to assure its future. Owner Operator George Janse reports that the Government has officially recognized the service, making it now an established part of the South African ambulance scene. That means a degree of co-operation that is important to all who have to make use of it. The second important step is that the Medical Aid fraternity of South Africa have also finally rubber stamped Sozo, and that means its services can now be claimed for. With these critical 'approvals' now behind him, George is looking forward to further improving the already high standard of Sozo's service. He tells us that two trainees have already been hand picked and will soon become part of Sozo. He says that in the past year the Ambulance and Rescue Vehicle have been called upon throughout the BAR Valley, which in itself is further evidence of the need for a private operation. He now looks forward to developing Sozo at least to the point where it owns, or can call upon the services of a properly fitted out medical rescue helicopter. Subscribers to the Sozo service can breathe even more easily. To subscribe, call George!